San Francisco Federal Defense Law Firm - Oberheiden, P.C. Oberheiden, P.C. is a federal law defense firm. Our team of defense attorneys and former federal prosecutors represent clients in San Francisco, throughout California, and across the nation. We have successfully handled cases involving most serious federal criminal offenses. If you are under investigation or facing charges in a federal criminal case, you do not have time to waste. The government is actively building its case against you; and the longer you wait to intervene means that, likely, prosecutors will have more time to be convinced that they have a case to pursue. You need to take action to protect yourself, and this starts with hiring experienced legal representation. When you entrust your federal case to Oberheiden, P.C., you will have a team of senior attorneys working together to build a strategic and comprehensive defense. We do not assign cases to individual attorneys and we do not expect you to let your case serve as a training ground for junior attorneys or associates. Facing a federal investigation or federal charges is an extremely serious matter, and you need to match the quality of your legal representation to the severity of your situation. We understand this deeply, and we do not ask you to accept anything less than the absolute best team effort we have to offer. Whenever possible, we seek to resolve our clients’ cases during the investigative stage, before charges get filed. This is the best-case scenario, and is what we strive for in each case where a client contacts us during his or her investigation. If it is not possible to avoid charges entirely, our goal is to seek to have our clients’ cases pursued civilly rather than criminally so that prison time stays off of the table. Securing bond demonstrates to the prosecution that there are weaknesses in its case and it is a critical step in the process following arrest and detention. At Oberheiden, P.C., we hold a significant success rate in securing bond for our clients in federal criminal proceedings. If you are formally charged, this does not necessarily mean that your case will go to trial. Two other outcomes are also possible: (i) you can negotiate a plea deal that minimizes the consequences of your arrest; or, (ii) you can convince the prosecution that, even though you have been indicted, there is still insufficient evidence to prove your guilt at trial. We have helped numerous clients achieve both outcomes. So if your case gets to this point, we will strategize with you to pursue the best possible resolution. Although we focus on securing favorable outcomes prior to trial, we are also experienced litigators and do not have any reservations about taking our clients’ cases to trial when necessary. If going to court is the only way to achieve justice in your case, we will go toe-to-toe with the prosecution for the goal to win a not-guilty jury verdict. Why Choose Oberheiden, P.C. in San Francisco, CA? If you are facing a federal investigation or federal charges, you have plenty of options when it comes to finding an attorney who will take your case. 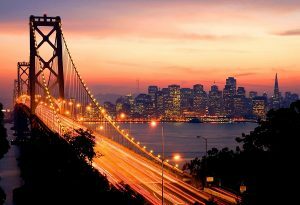 So, if you live or work in San Francisco, why should you choose Oberheiden, P.C.? Our Focus on Federal Cases. Unlike other law firms that will take any case that comes through the door, we limit our practice to federal matters. As federal law attorneys, we are devoted to finding the most effective and efficient ways to protect clients who are under investigation and facing prosecution by the federal government. Our goal is to constantly build our track record of successful representations. Our Broad Federal Experience. Our attorneys have either represented the government or represented private clients in cases involving practically every possible federal charge. We have handled thousands of cases involving the Federal Bureau of Investigation (FBI), the Drug Enforcement Administration (DEA), the Internal Revenue Service (IRS), the Office of Inspector General (OIG), the Department of Homeland Security (DHS), the Department of Defense (DOD), the Department of Health and Human Services (HHS), and many other federal agencies. Our Proven Results During Investigations and at Trial. We have represented clients in well over 1,000 federal investigations and we have taken more than 500 cases to trial. Our goal is to maintain a consistently high standard of professionalism and effective representation. Our Team Approach. With Oberheiden, P.C., you do not have a defense lawyer, you have a defense team. Our attorneys work together to strategize, explore defenses, and brainstorm ways to defeat the government’s case. We bring as much firepower to every case as possible; and despite our past success, we never take the outcome of any case for granted. Our Accessibility and Client Service. As our client, you can contact us when you need us. We understand that your federal case is a significant presence in your life, and we do what we do because we are passionate about helping our clients in times of crisis. If you have questions or information to share with us about your case, we want to hear from you, and if we cannot take your call immediately we will respond as soon as possible. Q: What can I do to protect myself if I am being targeted in a federal investigation? Q: If you cannot convince the government to drop the investigation, does this mean that I am likely to be convicted at trial? No, not at all. Prosecutors have a mandate to pursue cases that appear reasonably likely to result in convictions. The standard for obtaining an indictment (probable cause) is much lower than the standard for obtaining a conviction at trial (proof beyond a reasonable doubt). We routinely represent clients who have been charged with federal crimes. Our gal is to have our clients’ charges dropped before trial. We offer free and confidential case assessments for prospective clients in San Francisco, and you can contact us 24/7 to schedule an appointment with our federal criminal defense team. To put our decades of DOJ experience on your side, call (800) 810-0259 or contact us online today.